The Amazon basin, site of the world’s largest remaining tropical rain forest, is experiencing rapid ecological and socio-economic changes. This book examines the driving forces behind these changes, and considers current threats to the forests and their biodiversity. Various strategies for conserving forests and other resources are outlined, with an emphasis on the critical role of the private sector. 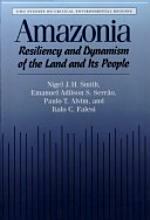 The book describes major land uses, particularly mining and agriculture, and assesses their environmental impacts. Particular attention is paid to development measures that help to alleviate pressure on the remaining wilderness. Perennial cropping systems are discussed in detail, especially agroforestry, and the potential for increased agricultural production on the Amazon floodplain is explored.